This morning in metals news, global aluminum production jumped in September, Germany’s steel sector warns against an abrupt withdrawal from coal-fired electricity and Tokyo Steel’s prices hold steady again. Global aluminum output jumped 2.5% year over year in September, according to an International Aluminum Institute (IAI) report. September output hit 5.3 million metric tons. 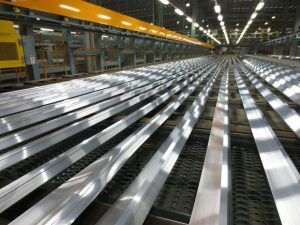 MetalMiner’s Take: World aluminum production rose 2.5% in September, reaching 5.3 million metric tons. January-September production for the base metal is also up by 0.3%. While both Chinese aluminum production (up by 3.6% year over year) and European production (up 0.8% year over year) are rising, North American production is down 4.3% down on a year-over-year basis. Therefore, buying organizations may continue seeing scarcity in the North American aluminum market, which will lead to a higher U.S. Midwest premium. North American companies are currently struggling with aluminum supply, despite the increase in world production. However, one of the great failings of “fundamental analysis,” in particular the study of supply and demand fundamentals, involves statistics such as those recently released from the IAI highlighting rising primary production on a year-over-year basis. Yet ask any U.S. buyer of semi-finished material if they think that rise in primary production has led to or will lead to the easing of supply for semi-finished materials and rest assured you won’t find a single supporter. MetalMiner seeks to study and analyze the specific underlying metal price trends and exchange-traded volumes — along with trends in the broader industrial and commodities markets — to assess potential price direction for underlying metals. Rising primary production levels have little to no correlation with material availability and, in some respects, even primary aluminum ingot prices. With respect to coal-fired electricity, Germany’s steel sector is arguing against an abrupt withdrawal from the power generation method, Reuters reported. According to Hans Juergen Kerkhoff, the head of Germany’s steel association, withdrawal from the power source would result in an increase in electricity costs for steelmakers of at least $161 million per year, per the Reuters report. MetalMiner’s Take: The German steel sector should protest from the mountaintops about the country’s withdrawal from coal-fired electricity. With the phaseout of nuclear power by 2022, the loss of coal-fired energy will make the largest economic power in the European Union even more dependent on natural gas and oil imports. Besides Germany’s steel-producing sector, access to competitively priced energy units goes well beyond basic steelmaking industries. The irony of Germany’s move to curtail the production of coal-fired electricity is that steel consumers will need to source finished goods like steel elsewhere — likely to countries with even poorer environmental track records. Prices of Tokyo Steel products will hold steady for the ninth straight month, Reuters reported. The firm last altered its prices in February, according to the report.